i. Railway's Online Travel Portal, www.irctc.co.in has now launched beta version of its new User Interface. The new link has more user friendly features for easier navigation. ii. By creating Next Generation e-Ticketing (NGeT) system the new online ticket booking system of Railways provides an easy and fast way of booking rail tickets by automating the journey planning and purchase of tickets. 1. A user can now enquire/search trains and check the availability of seats without login also. 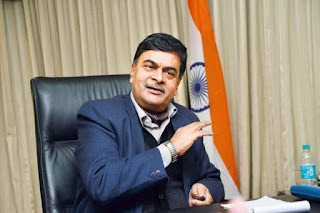 i. RK Singh, Minister of State for Power, launched the web portal and an app namely 'PRAAPTI' that stands for ‘Payment ratification and analysis in power procurement for bringing transparency in invoicing of generators’. ii. The portal ‘www.praapti.in’ has been developed to bring transparency in power purchase transactions between Generators and DISCOMs. i. The Ministry of Women and Child and Development, Government of India has signed an MoU with Department of Women and Child Development, Government of Uttar Pradesh, in New Delhi for management of Home of Widows at Sunrakh Bangar, Vrindavan. ii. The Ministry of Women and Child Development has constructed this shelter home for widows with a capacity of 1000 inmates. The MoU shall be in force for a period of 2 years. · Smt. Maneka Sanjay Gandhi is the cabinet Minister of Women and Child Development. i. Goa celebrates its Statehood Day as people’s demand for full statehood was attained on 30th May 1987, when Goa became India’s 25th state. Daman and Diu were separated from Goa and continue to be administered as a union territory. ii. Earlier, Goa was a union territory, namely, Goa, Daman and Diu for all administrative and governance considerations. Attaining statehood opened several windows of development for the state. · Goa Governor- Mridula Sinha, Chief Minister- Manohar Parrikar. i. The Gujarat government unveiled its 'Reuse of Treated Waste Water Policy' which aims to reduce the state's dependence on freshwater sources like the Narmada river. ii. Chief Minister Vijay Rupani and Deputy Chief Minister Nitin Patel launched the policy at a function held in Gandhinagar. The policy will promote the use of treated wastewater and will see the setting up of sewage treatment plants (STP) in all major towns and cities of Gujarat. · Om Prakash Kohli is the Present Governor of Gujarat. · Sardar Sarovar Dam, built over Narmada River is located in Gujarat. i. The Gaj Yatra campaign was flagged off by the Wildlife Trust of India (WTI) Brand Ambassador Ms Dia Mirza at an event organised in Meghalaya. WTI and the Ministry of Environment, Forest & Climate Change, Government of India, formally launched the unique campaign. ii. ’Gaj Yatra’, a “journey celebrating India’s national heritage animal”, aims at securing 100 elephant corridors across India. i. On the first leg of 3-Nation visit, PM Modi has visited Indonesia. India and Indonesia signed 15 MoUs in the fields of defence, scientific and technological cooperation, railways and health, among others. ii. PM Modi and Indonesian President Joko Widodo in a joint statement also agreed to develop further cooperation in maritime sector for "immense stability" in the region. · Indonesia Capital- Jakarta, Currency- Indonesian rupiah, President- Joko Widodo. i. Paraguay gets first interim woman President Alicia Pucheta for the first time in its history after outgoing leader Horacio Cartes stepped down ahead of schedule. ii. Paraguay has just eight women among its 45 senators, and 11 among the 80 members of the lower house. · Paraguay Capital- Asuncion, Currency- Paraguayan guarani. i. Justice R.K. Agrawal has been appointed as the President of the National Consumer Disputes Redressal Commission (NCDRC). ii. He has replaced Justice D.K. Jain, who retired recently. i. Software giant Microsoft has surpassed Google’s parent company Alphabet in market capitalisation for the first time in three years. Microsoft has now become the third most valuable firm globally after Apple and Amazon. ii. Microsoft had a market cap of $753 billion at the close of trading, almost $14 billion ahead of Alphabet. While Apple leads with a market cap of nearly $924 billion, Amazon is at a distant second, with nearly $783 billion. · Microsoft Corporation is an America Based technology company. · CEO- Satya Nadella, Headquarters- Washington DC. i. Moody's Investors Service report has cut India's GDP growth forecast to 7.3% in 2018, from the previous forecast of 7.5% due to higher oil prices and tighter financial conditions. ii. It, however, kept growth expectation for 2019 remains unchanged at 7.5%. i. Indian skipper Virat Kohli has emerged as the International Cricketer of the Year at the CEAT Cricket Ratings awards, which were presented in Mumbai. 1. International Batsman of the Year Award: Shikhar Dhawan (India). 2. International Bowler of the Year Award: Trent Boult (New Zealand). 3. T20 Bowler of the Year Award: Rashid Khan (Afghanistan). 4. Outstanding Innings of the Year Award: Harmanpreet Kaur (India). 5. Lifetime Achievement Award: Farokh Engineer (India). 6. T20 Batsman of the Year Award: Colin Munro (New Zealand). 7. Domestic Player of the Year Award: Mayank Agarwal (India). 8. U19 Player of the Year award: Shubman Gill (India). 9. Popular Choice Award: Chris Gayle (West Indies). i. Top Indian discus thrower Vikas Gowda retired after competing at the highest level for more than 15 years, during which he became the first and only Indian male to win Commonwealth Games medal in the discipline. ii. His retirement was announced by the Athletics Federation of India. Gowda holds the national record of 66.28m (achieved in 2012). · Silver in 2014 Asian Games.